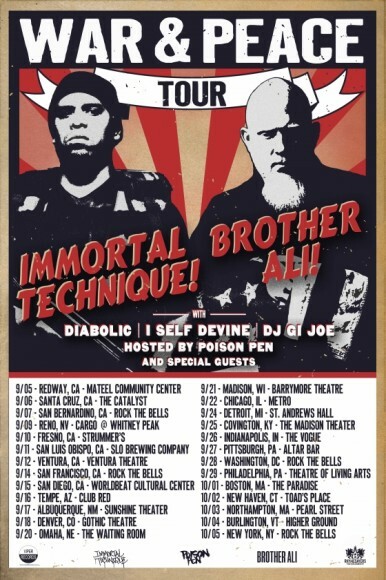 Hip hop legends Brother Ali and Immortal Technique will be touring together this Fall for the War & Peace Tour. Kicking off on September 5th, the artists will embark on a comprehensive North American tour. They will also be joined by Diabolic and I Self Divine. Other special guests will vary date to date. With tickets on sale today, fans will have the option for VIP ticket packages which include a meet and greet. Ticket prices start at $17.50.